Hello and welcome to our restaurant! We are Gary and Sandra, owners of the Christmas Farm Inn & Spa. Together we have lived and worked abroad for many years, sharing our love for good food, drink and travel. 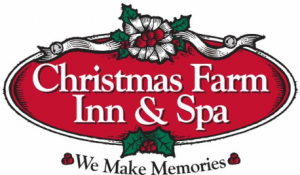 Many culinary highlights later, we acquired the iconic Christmas Farm Inn in Jackson NH in 2010, making a dream reality. Our guiding principle for the Inn’s restaurant has always been authenticity, quality and a sense of fun. Surrounded by a team that shares these values, our restaurant has become well-known for its original cuisine, craft cocktails and home-made desserts. Our menu is a true team effort, bringing together the many tastes and visions from a passionate culinary team that shares a love of authentic food, full of original flavors with inventive new takes on classic dishes. We believe that our different backgrounds and stories helped us create a distinctive restaurant experience that combines local and worldly flavors in a cozy, unpretentious setting. Every meal is cooked fresh, every dessert made in house. Kids enjoy their own menu, activities page as well as movie night in the adjacent sitting-room every night from 5:00 pm. The Inn and restaurant have a historic significance to the town of Jackson; as one of the oldest estates dating back to the 18th century, the property was once home to the town’s post office and jail and today still incorporates the town’s first church from 1803. In an ever changing and evolving world, the Christmas Farm Inn remains firmly at the heart of the long tradition and history that makes Jackson a quintessential New England experience. Today, our restaurant offers traditional, cozy comfort with excellent food at fair prices and as such maintains its appeal with locals and in-house guests alike. The cozy ambience and traditional décor reflect the feel and simplicity of the New England Farm heritage. Having a local business, we understand and value our impact on the local community, be it employment, buying local goods and services or supporting our local charities and institutions. As members of the Valley Originals, we donate a percentage of our profits to help support local causes and improve the quality of life in the valley, for the betterment of all. What can we say; we love this valley!